We have a number of great dogs looking for their forever homes! Many of the dogs lost their homes as a result of their family moving, unforeseen circumstances occurring in their family's life, or medical issues that no one else could or would take care of. Others were strays, found abandoned on the road and never claimed, while yet others were rescued from situations of abuse or as code red shelter dogs past their euthanasia date. We do not have small dogs, young children, or cats at the rescue, so unless otherwise noted in their bio, we do not generally know offhand how each individual dog will do, but would be more than happy and able to arrange a temp test with any of the above if needed! And remember, if you can't adopt, you can always foster! Buddy is the SWEETEST boy, and just loves affection and praise. Our trainers love that he prances for them during training time. :) He is Ariel's brother, and one of a NUMBER of dogs rescued from the same location. Buddy would make a wonderful cuddle buddy, or a good activity partner for the day, depending on your preference at the time! He does have a few non-cancerous and totally harmless bumps (which have been seen and tested by a veterinarian), and receives eye drops for an eye condition that developed from years of him being tied out outside. 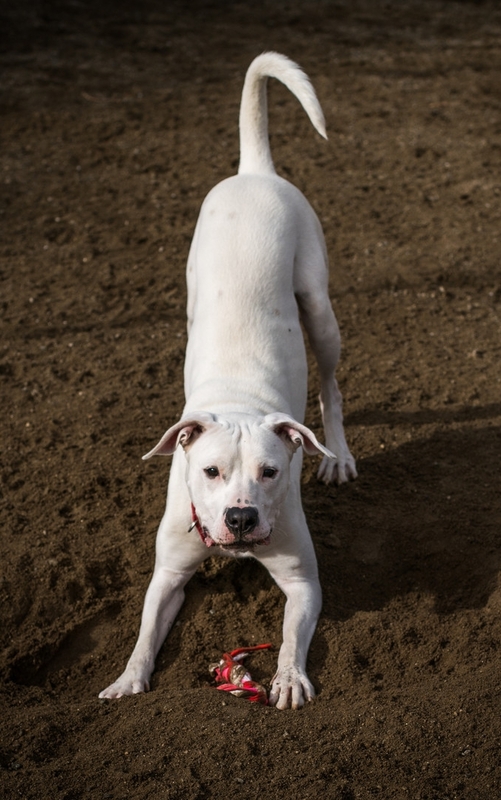 Casper is an energetic young Dogo male who is looking for a loving but structured and stable home. He loves giving kisses and wiggles, but he can be selective with people and dogs, so he does need further training and supervision to help build continuous positive interactions. He may have a bright future as a working dog, as he is very intelligent, athletic, and shows substantial true-to-breed characteristics. Draco is a very sweet young man! He's goofy, and silly, and awkward, and DEAF! He's good with people and dogs, but being a Dogo, he can be a little unsure in the beginning, so does require proper introduction. However, don't think he's not social: he lives and plays with about 20 other rescue dogs daily! He is fully trained with hand signals, and loves walking, cuddling, and giving kisses. His feet shuffle when he walks, but he doesn't know! She and Buddy have both done extremely well with the basic training that have been started with them, and love the praise they get as they learn! Clyde is the sweetest, happiest, mellowest friend you could ask for. He loves people, he's great with other dogs, and he's very well-mannered in the house. He happily grunts when he sees his people, and is just the perfect dog all around. He even has the goofy bulldog mouth ;) He has a little arthritis; which he takes glucosamine & chondroiton. He's totally worth it, and it's pretty inexpensive! Hunter has the absolute goofiest smile to go with his silly, lovable personality! He grins from ear to ear at his favorite people, and dances in circles. He can be a little unsure of new people and dogs, so requires proper introduction, but once he knows them, he is the absolute best boy! He's a blast to take walks with, and lights up the day! Training not only helps a dog learn to behave properly in their environment and smooth out any bumps in their new transition, but is also a GREAT bonding experience for a dog and owner to participate! at the minimum, given a basic temperament test by a professional trainer. Uh-oh... I fell in love. Awesome! We understand; it's hard not to. Give our site manager, Marcus, a call at (951) 767-2428 and we can set up a meet-and-great with what could possibly be your newest and truest companion. You can meet your dog of interest, or give others a chance to steal your heart too! For the second date, we can set up a play-date with our hopeful adoptee and any existing dogs or animals you have at home! The final step of course is the nitty-gritty: home checks, adoption paperwork, and then you get to welcome your new friend home!